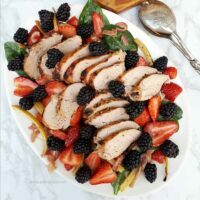 Balsamic Roasted Pork And Berry Salad is a healthy lunch or light dinner – NO dressing is required as all the ingredients are so juicy ! Last week we still had the odd day or two when it was bitterly cold. Our Spring started on the 1st of September, and after the cold days last week, we now have a heatwave in Gauteng ! 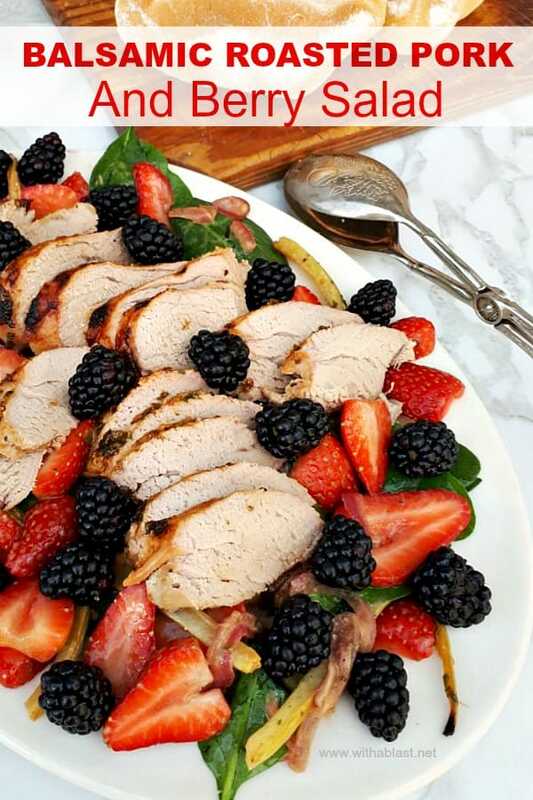 That is when recipes like this Balsamic Roasted Pork and Berry Salad comes in very handy. Quick to make, and perfect for the in between season weather. Speaking of cold weather – we had a snowfall once (yes, only once!) in Gauteng in 1981. It lasted about two to three days, but the weirdest part was that it happened in September ! And as I have already mentioned, September is the start of our Spring season in South-Africa. Usually our weather is very predictable, only a couple of weeks of real cold during Winter, with Spring and Summer being just nice warm weather. 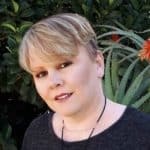 Don’t get me wrong, we do have some days that I want to pack up and move to Alaska, but in general South-Africa’s weather is great. I have mentioned numerous times over the years, that our family can just about live on salads. especially meaty, healthy salads. 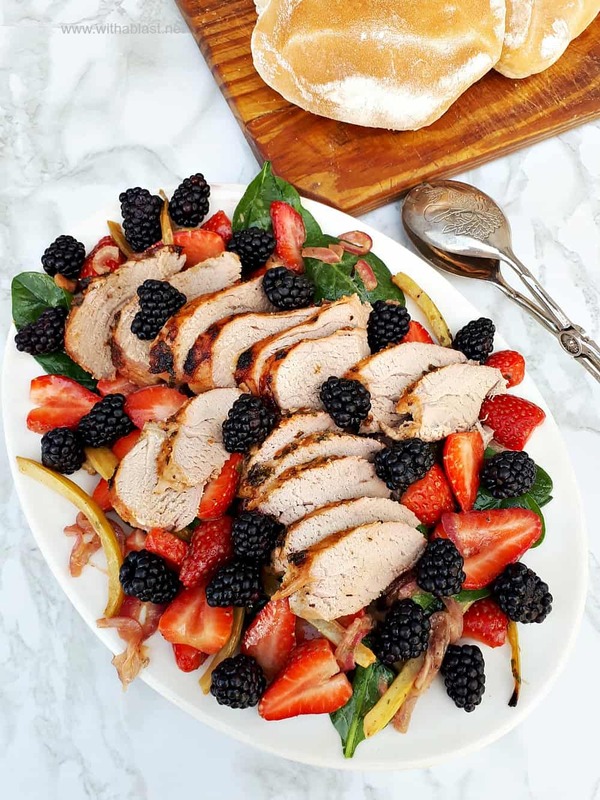 This Balsamic Roasted Pork and Berry Salad is one of those ! Serve the Salad slightly warm during cooler weather, or cold on a hot day. I make a small side dressing (recipe in the notes on the recipe card) to serve with the salad. Each person can then help themselves to as much (or none!) according to their preference. 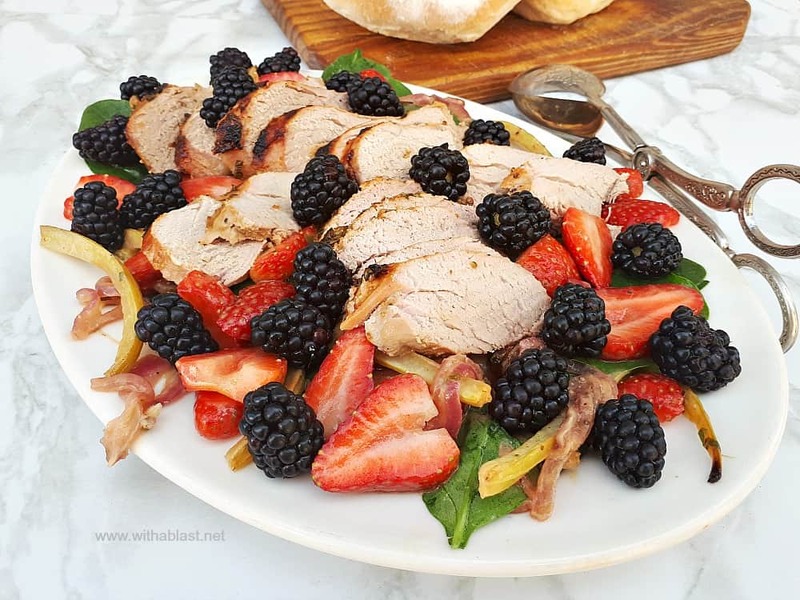 The roasted Pork is tender and juicy, add the Onion, Celery and the Berries and you do not really need a dressing as well. But, even myself, want that little bit of extra taste (if not for the sauciness alone) every now and then. Although, to be honest, I normally enjoy the salad as is, no dressing. My son and hubby… well, they are somewhere in between. Sometimes with a little dressing, other days, no dressing. The Dressing is so quick to make, therefore if you notice your family prefers the dressing, a second batch can be whipped up in a minute or two. I eat a lot of salads and am always looking for new ways to change them up. I’ll be giving this recipe a try! Love the combination of flavors in this salad. Great photos by the way! The meaty salad looks fabulous. Love all the flavor combinations you put together. I can’t wait to give this salad a try. 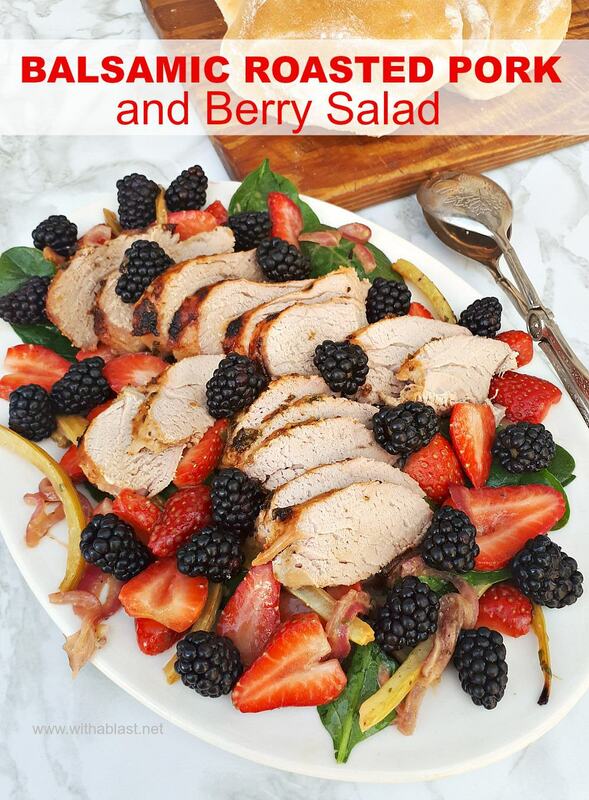 I love the mix of sweet/tart berries in this lovely salad. Balsamic, dijon, rosemary – I’m swooning over these flavours! What a great dinner idea! Love all of the color and fresh flavor! Such awesome flavours in this! I love the thought of the dressing really bringing out all the other tastes. I adore balsamic and this salad was AMAZING! So much flavor!